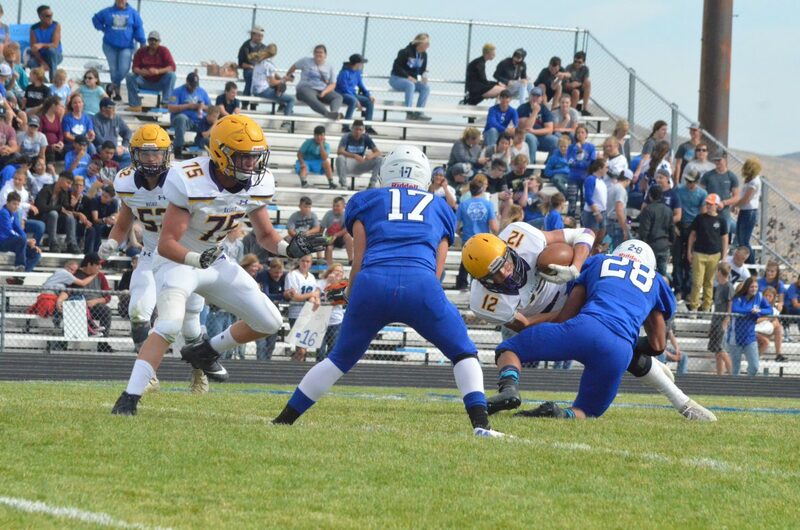 Moffat County High School's Angel Rodriguez works to hold back Jake Reardon during Saturday's Homecoming game with Basalt. 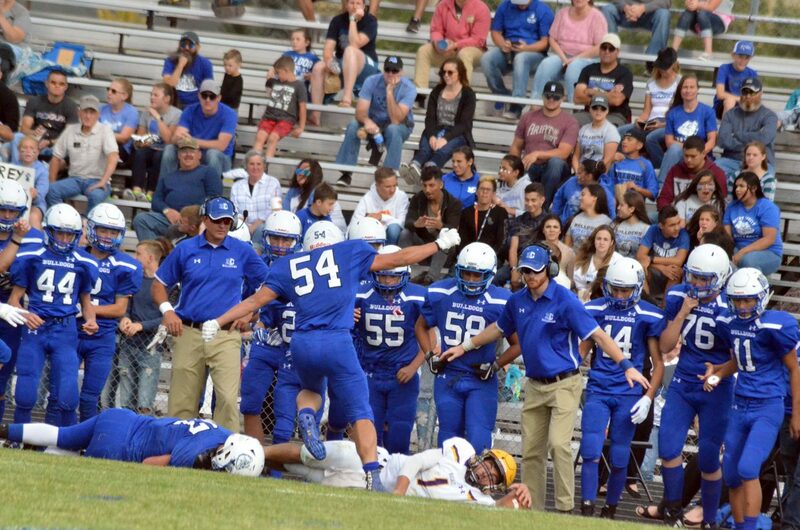 Moffat County High School's Kevin Hernandez punts during Saturday's Homecoming game with Basalt. 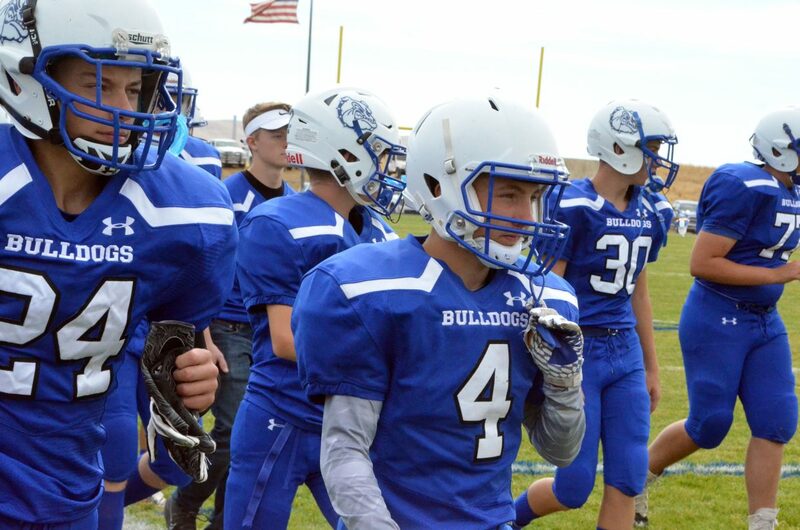 Moffat County High School football captains Jared Baker and Josh Teeter lead the team back to the field during Saturday's Homecoming game with Basalt. Moffat County High School cheerleaders take the field for a halftime performance during Saturday's Homecoming game with Basalt. 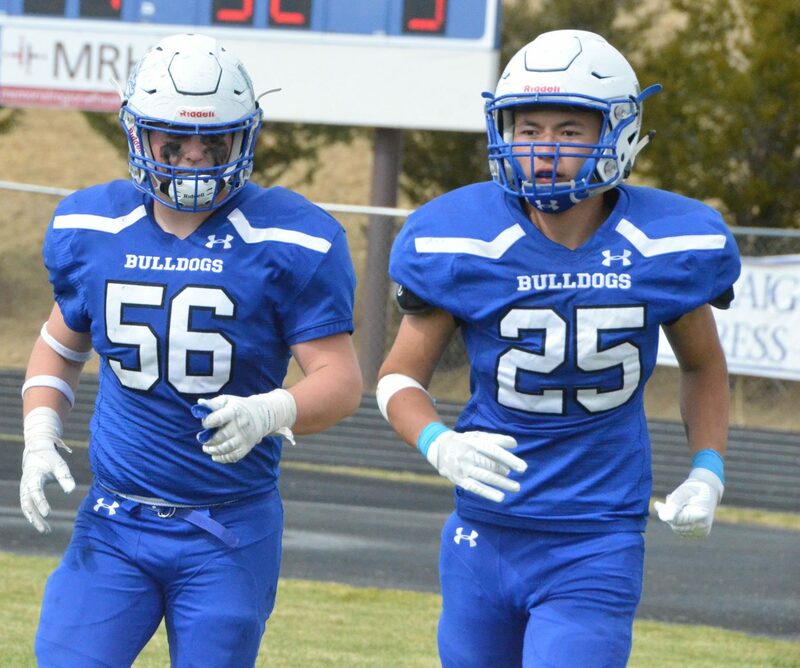 Moffat County High School's Drake Doherty and Daniel Cruz remain upbeat as Bulldogs retake the field during Saturday's Homecoming game with Basalt. 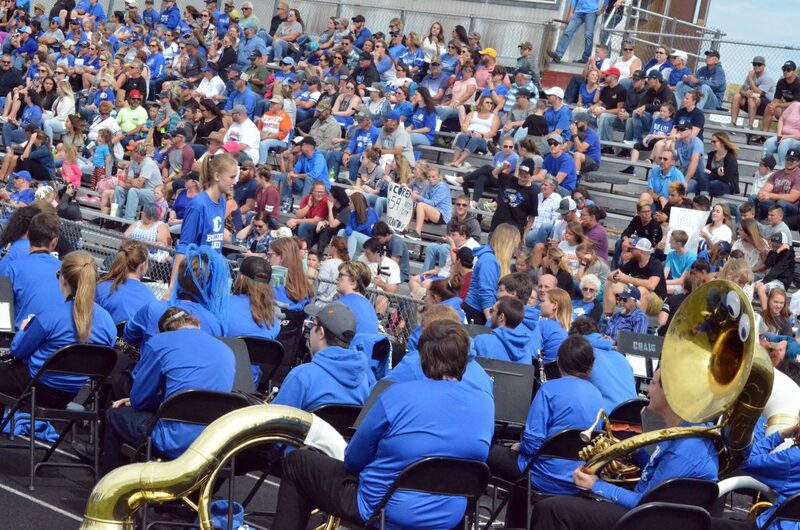 The stands are packed during Saturday's Homecoming game with Basalt. 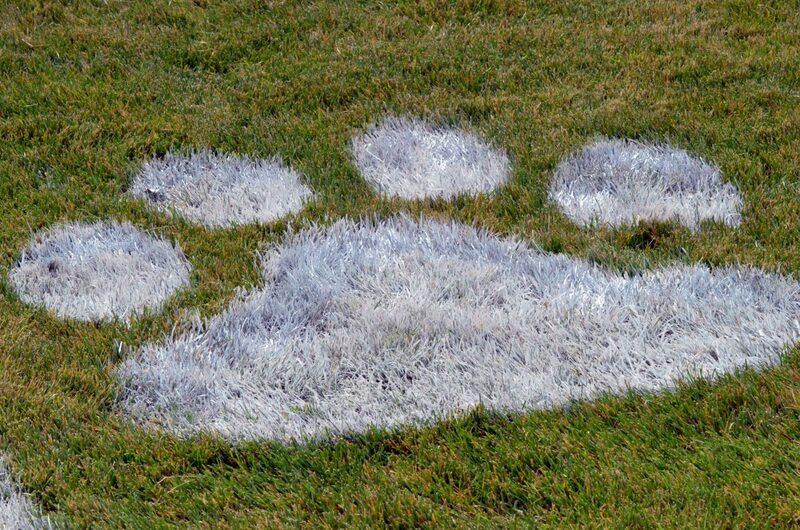 Moffat County High School's Bulldog pawprints decorate the end zone during Saturday's Homecoming game with Basalt. 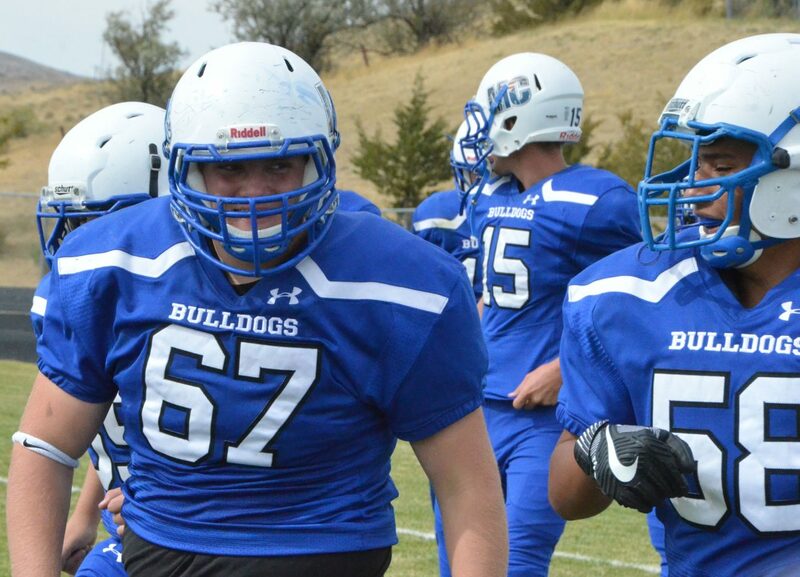 Moffat County High School Bulldog pride is on display at Homecoming game Saturday. 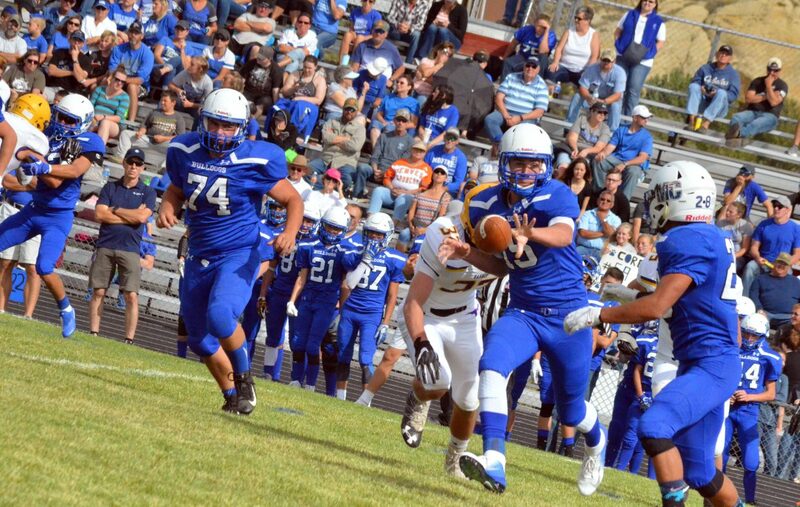 Moffat County High School's Colby Beaver fights for a few yards during Saturday's Homecoming game with Basalt. Moffat County High School's Angel Rodriguez wrestles Basalt's Tai Kim to the ground during Saturday's Homecoming game with Basalt. 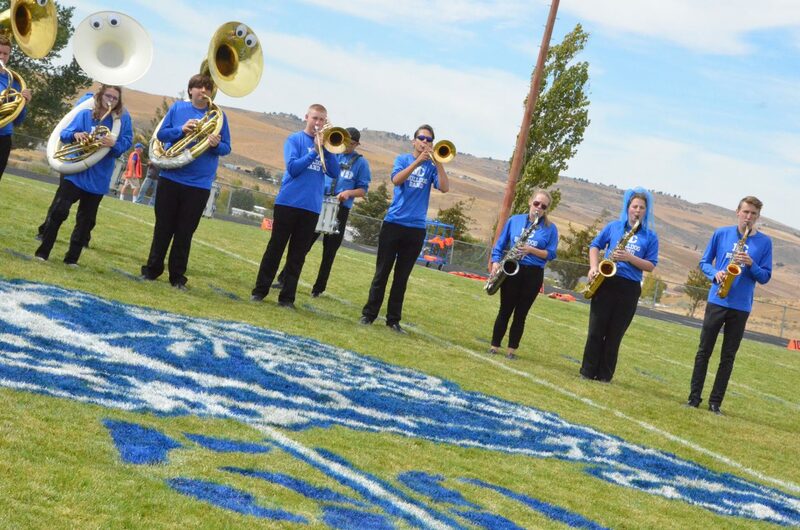 The Moffat County High School band performs at halftime during Saturday's Homecoming game with Basalt. Moffat County High School's Cale Scranton strips the ball loose from Longhorn Jake Reardon during Saturday's Homecoming game with Basalt. 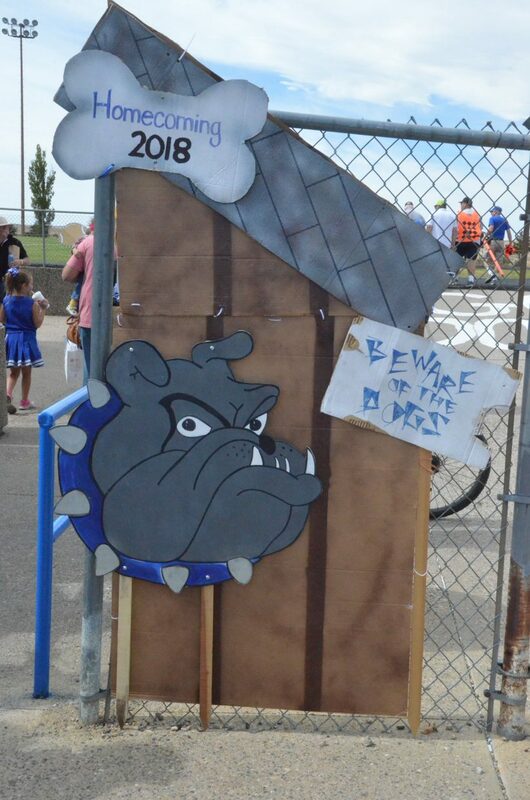 The doghouse décor greets spectators at the gates of the Bulldog Proving Grounds for Moffat County High School's Homecoming game Saturday. 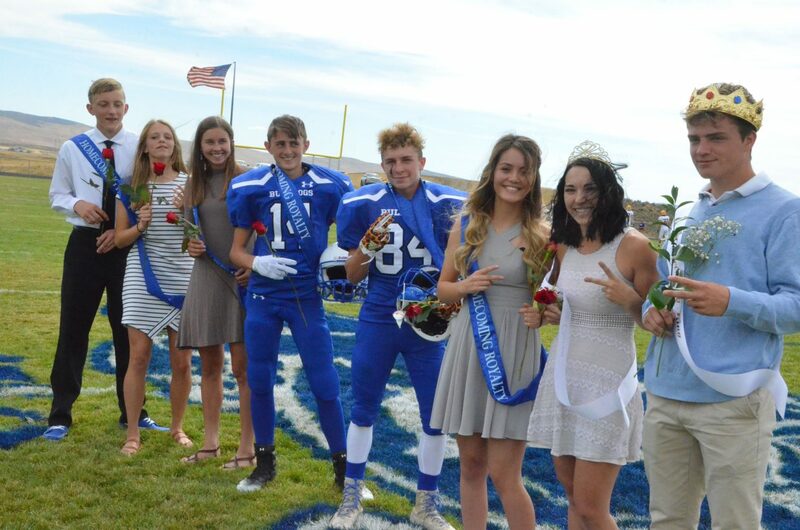 Moffat County High School's royalty and attendants take one more group photo at halftime during Saturday's Homecoming game with Basalt. Moffat County High School's Bryson Davis manages a smile as he's led off the field by trainers with an injury during Saturday's Homecoming game with Basalt. Moffat County High School's Colby Beaver rolls out and tosses to Kevin Hernandez during Saturday's Homecoming game with Basalt. 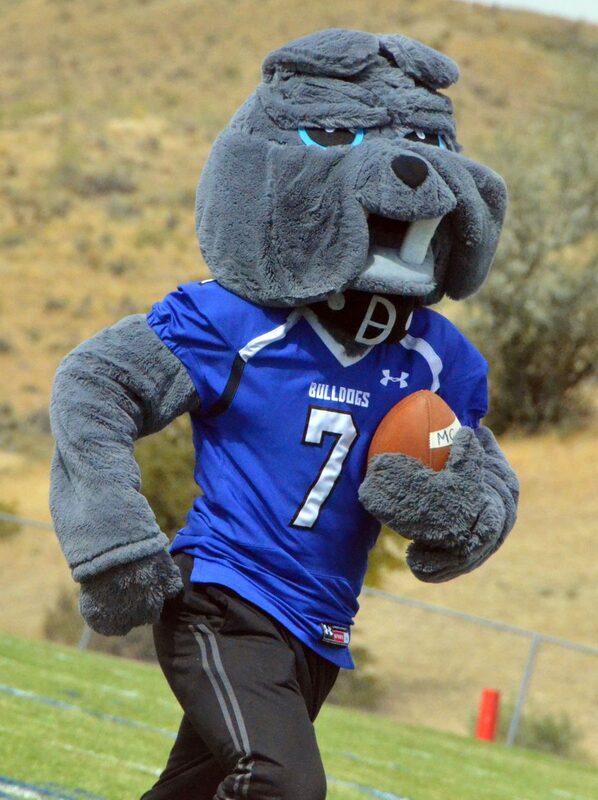 The Moffat County High School Bulldog mascot presents the game ball via delivery by Classic Air Medical helicopter at the Homecoming game Saturday. 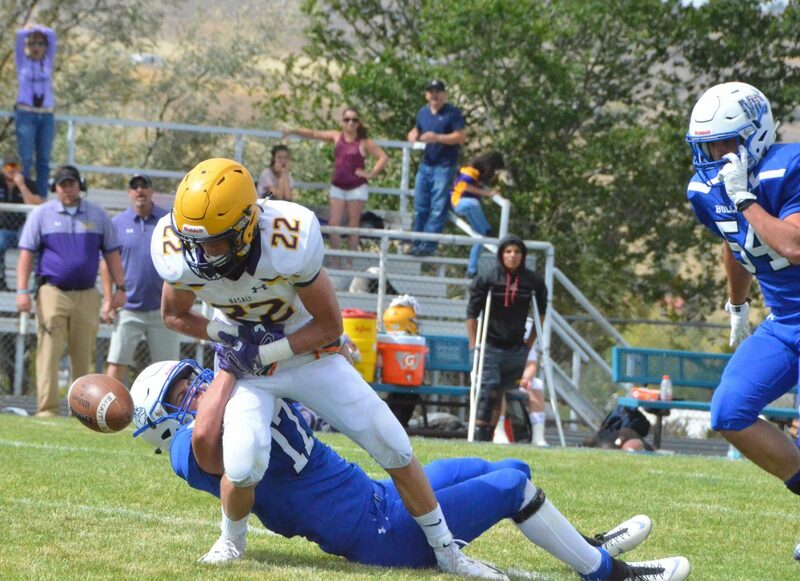 Moffat County High School's Kevin Hernandez wraps up Longhorns' Jackson Rapaport during Saturday's Homecoming game with Basalt. 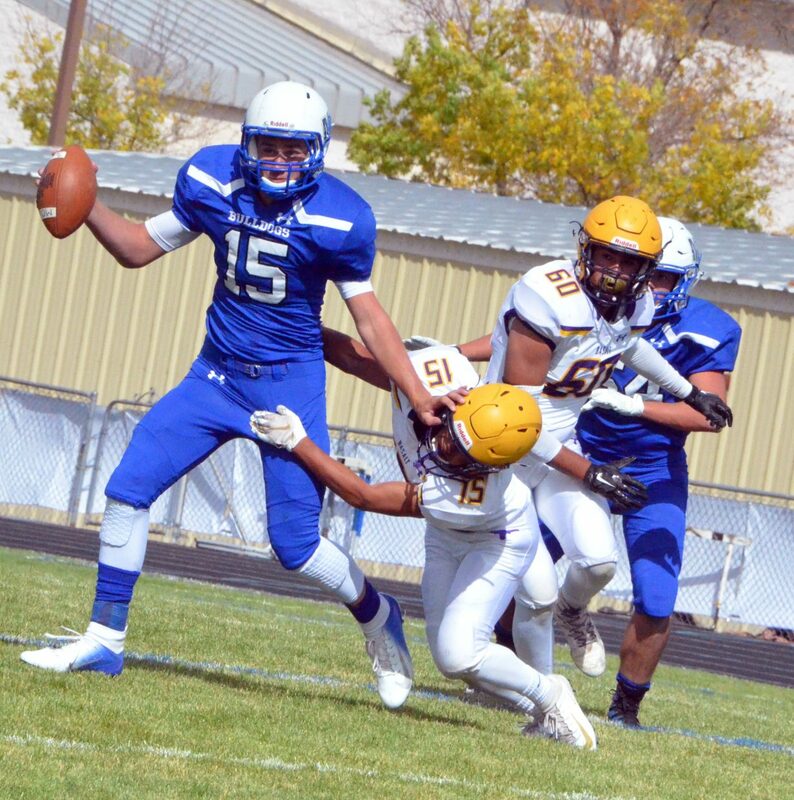 Moffat County High School's Jared Baker and Drake Doherty close in on Longhorn quarterback Trevor Reuss during Saturday's Homecoming game with Basalt. The ball catches some extra air as Moffat County and Basalt battle in deep pass coverage during Saturday's Homecoming game with Basalt. 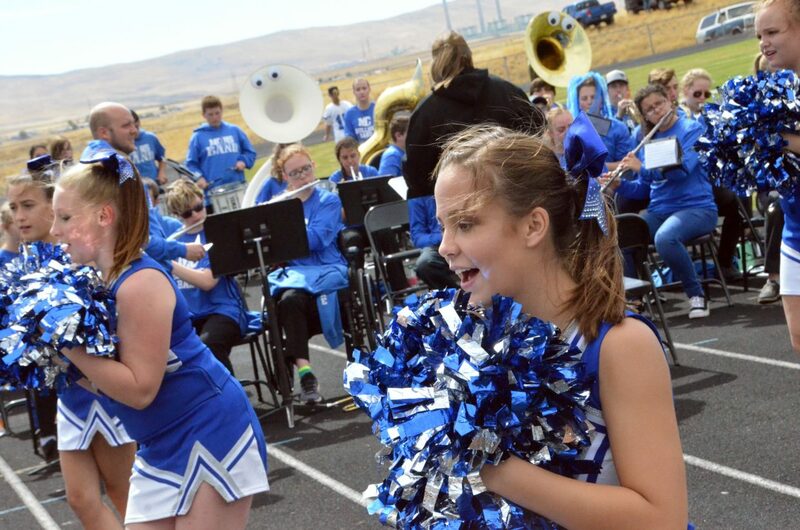 Moffat County High School cheerleaders and the MCHS band get the crowd going to start Saturday's Homecoming game. Moffat County High School's Colby Beaver sheds a tackle by Longhorns' Rulbe Alvarado during Saturday's Homecoming game with Basalt. 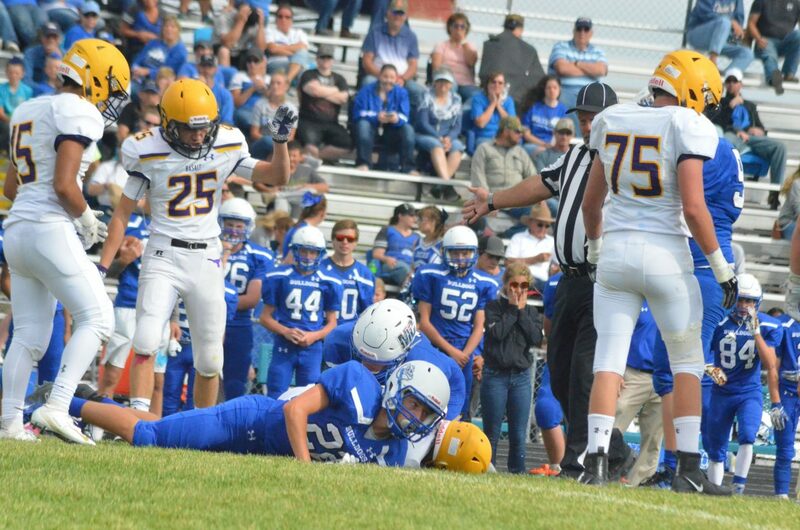 Moffat County High School's Josh Teeter trips up Jake Reardon at the 50-yard line during Saturday's Homecoming game with Basalt. 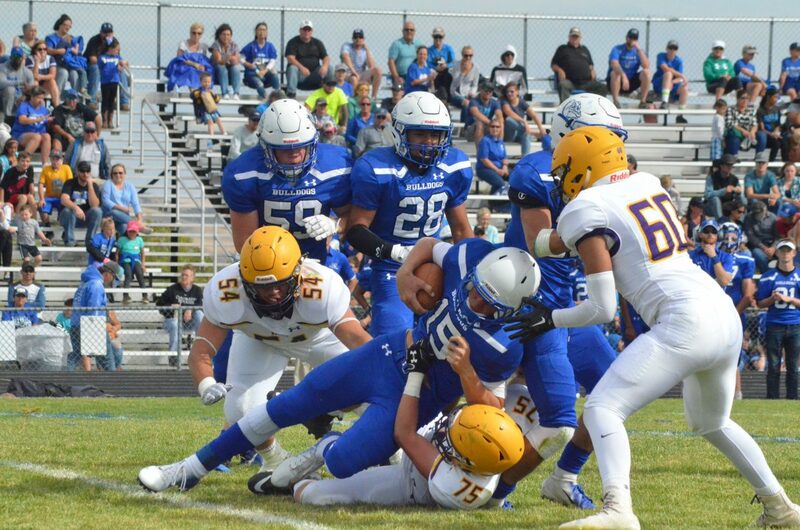 Moffat County High School's Angel Rodriguez vaults over the action as teammate Cale Scranton brings down Longhorn quarterback Trevor Reuss at the Bulldog sideline during Saturday's Homecoming game with Basalt. 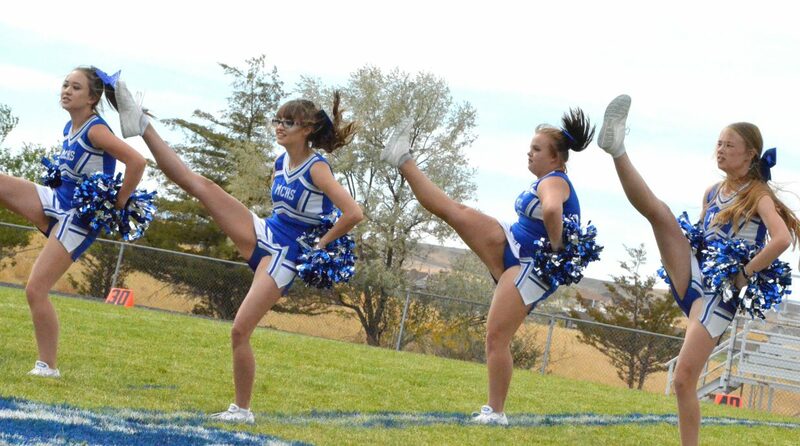 Moffat County High School cheerleaders add a little kick to their halftime show during Saturday's Homecoming game with Basalt. 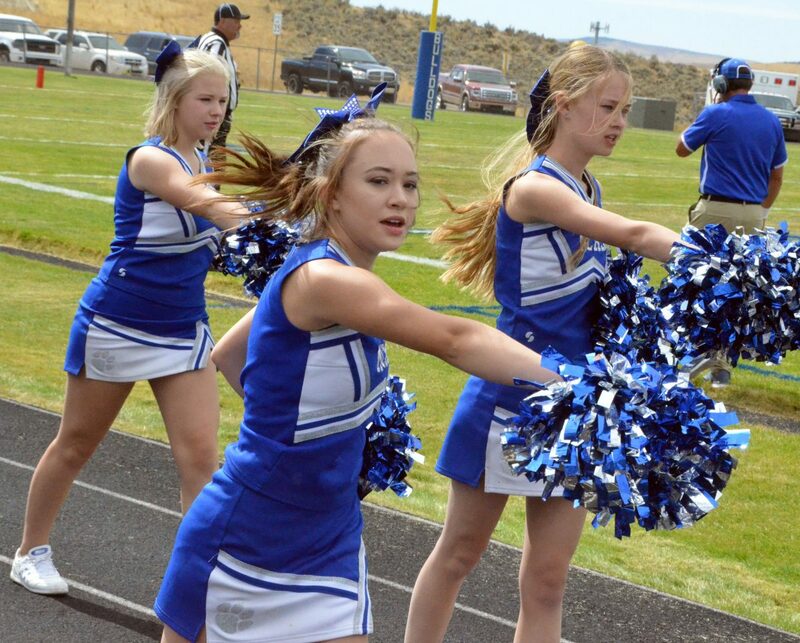 Moffat County High School cheerleaders get their routine going to start Saturday's Homecoming game. 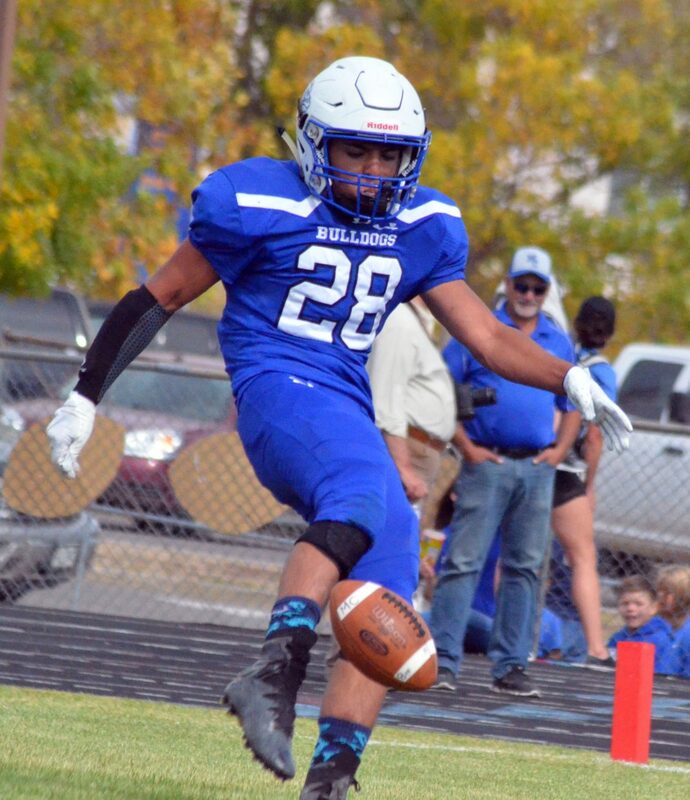 Moffat County High School's Kevin Hernandez follows his blocking during Saturday's Homecoming game with Basalt. 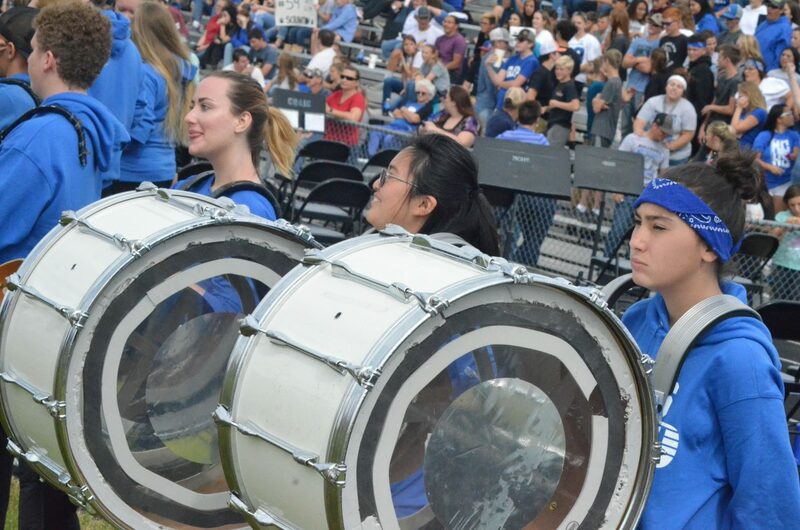 The Moffat County High School band's percussion section readies for the halftime show during Saturday's Homecoming game with Basalt. 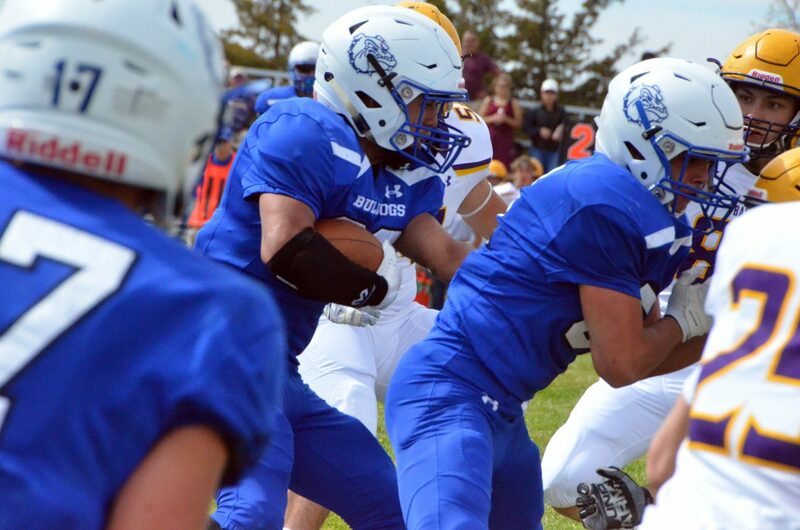 Moffat County High School's Dario Alexander looks for a gap on the Bulldogs' opening drive during Saturday's Homecoming game with Basalt. Moffat County High School's Cale Scranton looks to gain solid yardage after a reception during Saturday's Homecoming game with Basalt. 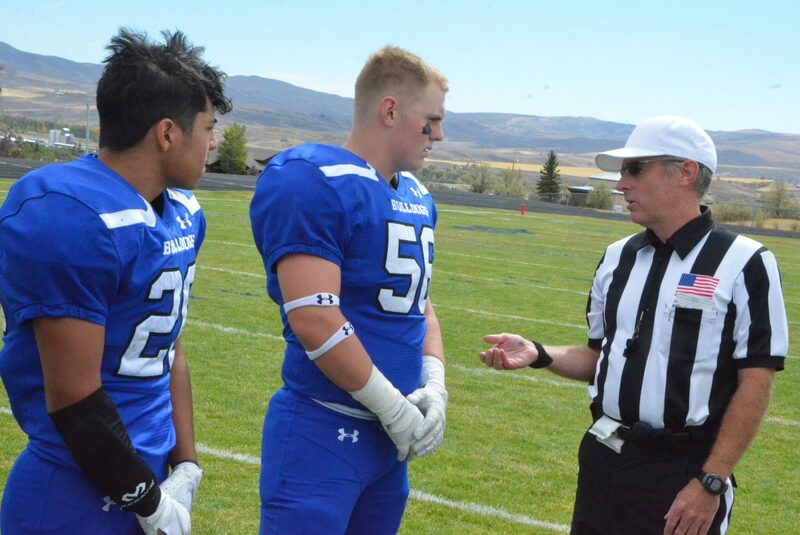 Moffat County High School's Kevin Hernandez and Jared Baker opt to kick after winning the coin toss during Saturday's Homecoming game with Basalt. 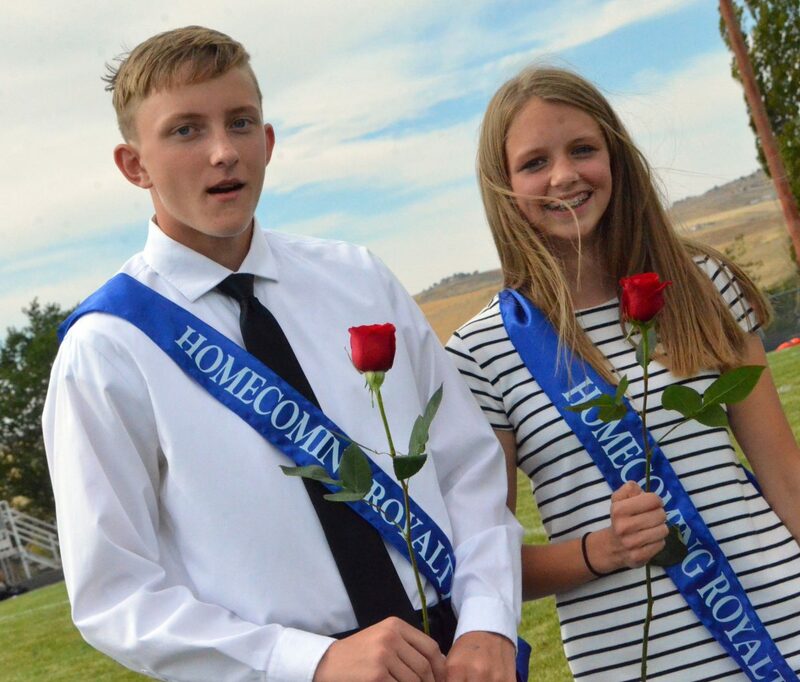 Moffat County High School's Emaleigh Papierski and Blake Juergens accept sophomore attendant honors at halftime during Saturday's Homecoming game with Basalt. 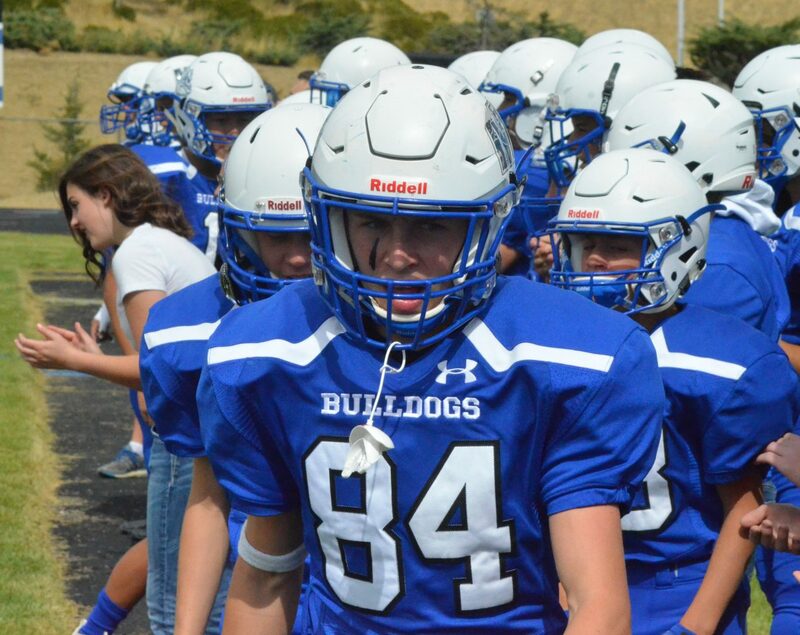 Moffat County High School's Dagan White gets his energy focused on the Bulldog sideline Saturday's Homecoming game. Moffat County High School football players congratulate the Longhorns on a well-played match after Saturday's Homecoming game with Basalt. 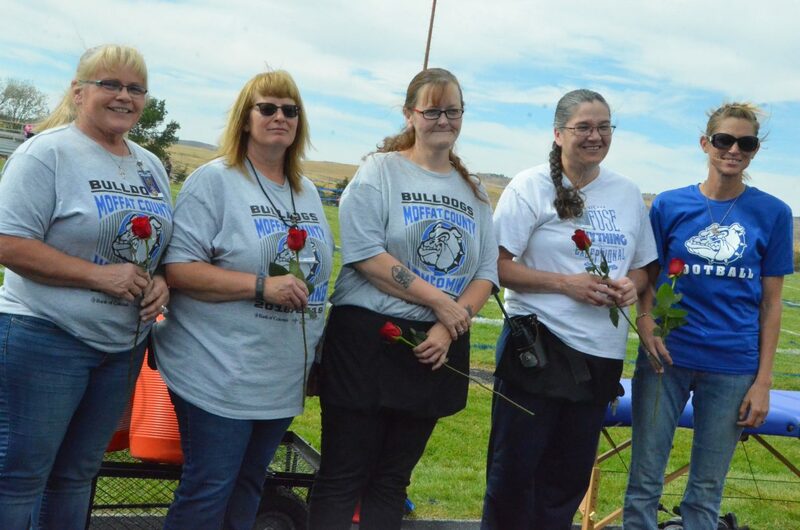 The Moffat County High School custodial staff is acknowledged as honored faculty at halftime during Saturday's Homecoming game with Basalt. Moffat County High School's Cale Scranton steps his way into the end zone for a touchdown to start Saturday's Homecoming game with Basalt. 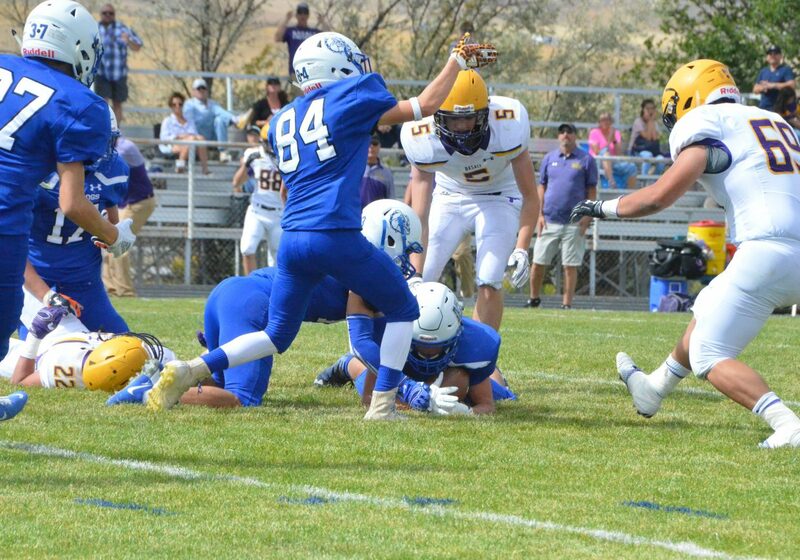 Moffat County High School's Colby Beaver gets low to the ground during Saturday's Homecoming game with Basalt. 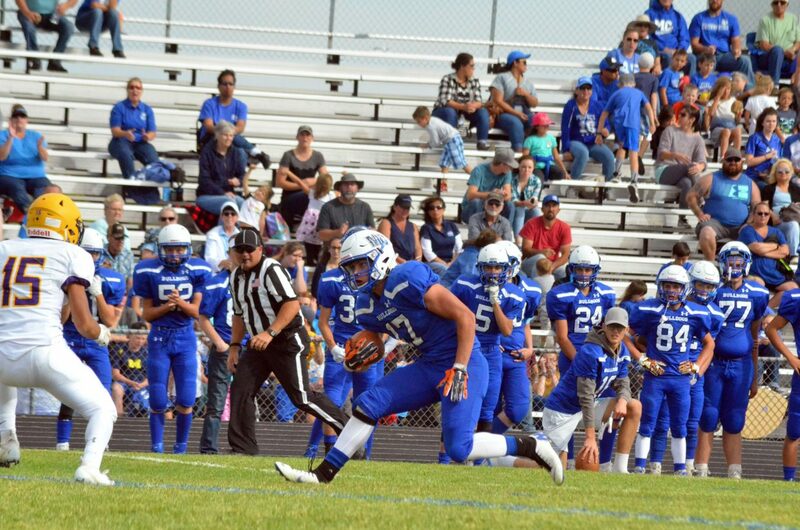 Moffat County High School players signal to the refs as Kevin Hernandez makes a fumble recovery during Saturday's Homecoming game with Basalt. 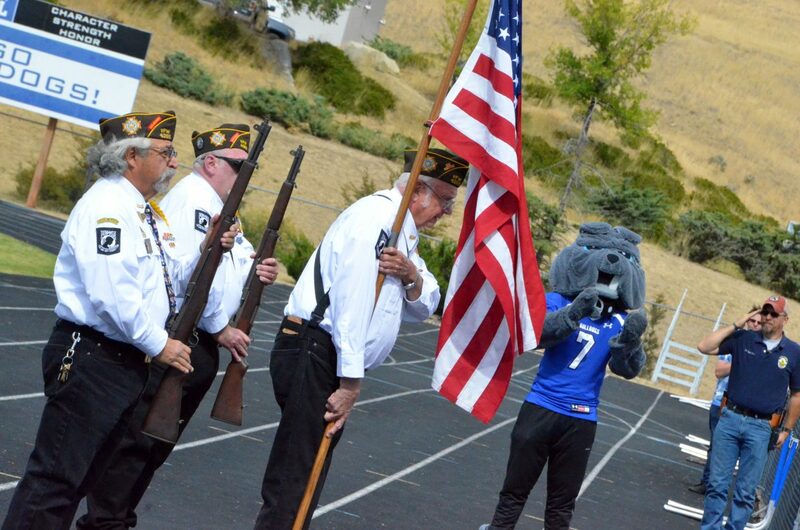 Crag veterans serve as a color guard to start Moffat County High School's Homecoming game with Basalt. 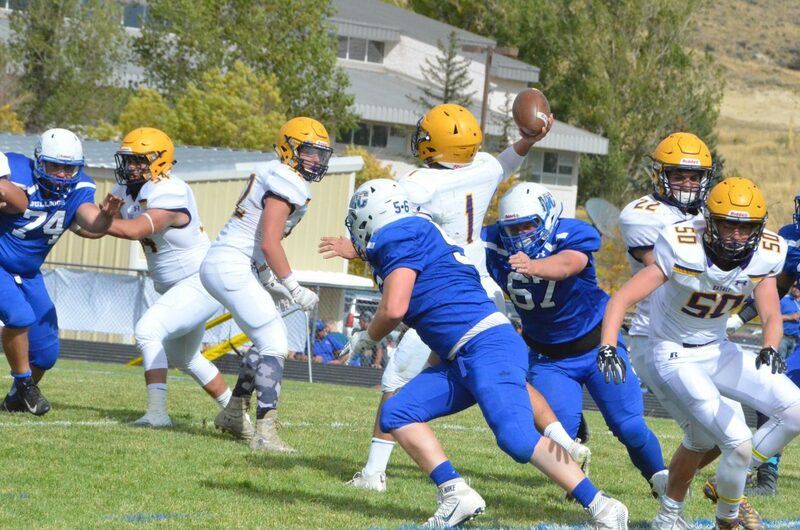 Moffat County High School's Cale Scranton and Jared Baker look to blindside Longhorn Trevor Reuss before he throws during Saturday's Homecoming game with Basalt. 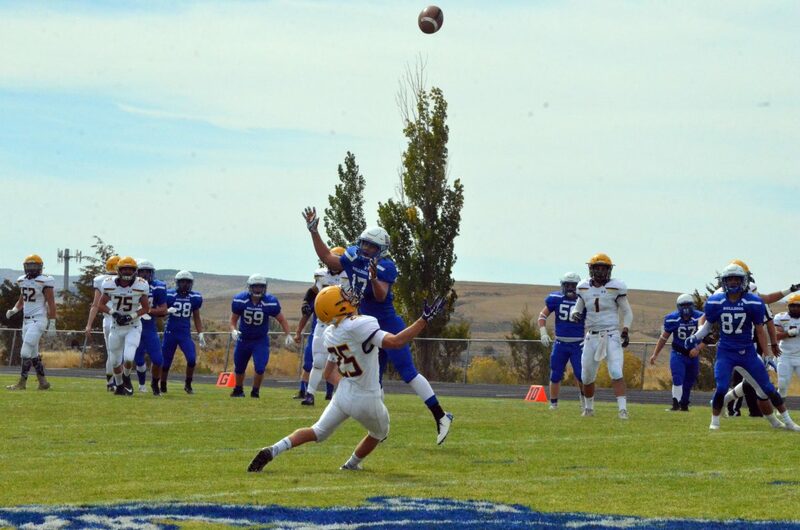 Moffat County High School's Josh Teeter sweeps out to get around Basalt during Saturday's Homecoming game. 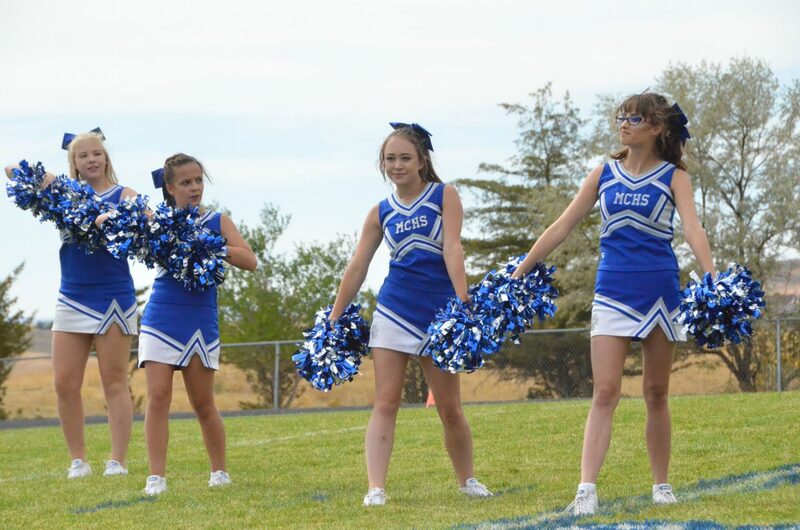 Moffat County High School cheer accessories are ready to go during Saturday's Homecoming game with Basalt. 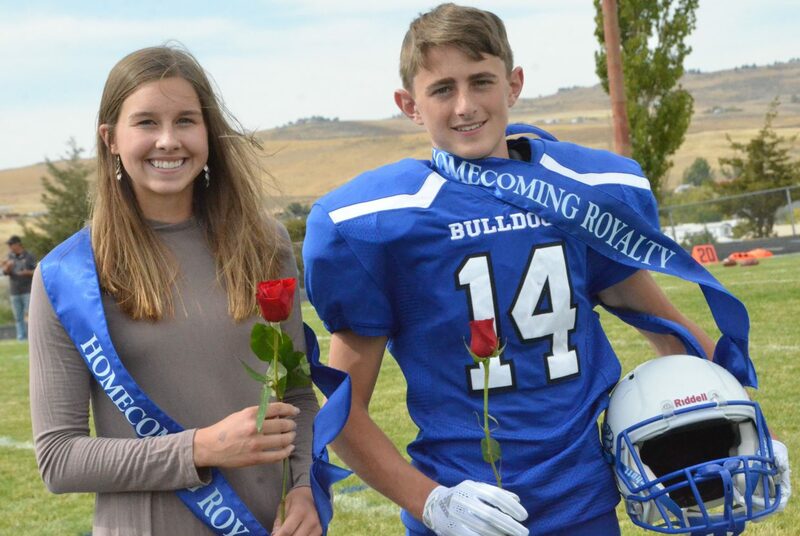 Moffat County High School's Logan Hafey and Emma Jones accept freshman attendant honors at halftime during Saturday's Homecoming game with Basalt. Moffat County High School's Jared Baker alerts teammates to a Longhorn audible during Saturday's Homecoming game with Basalt. 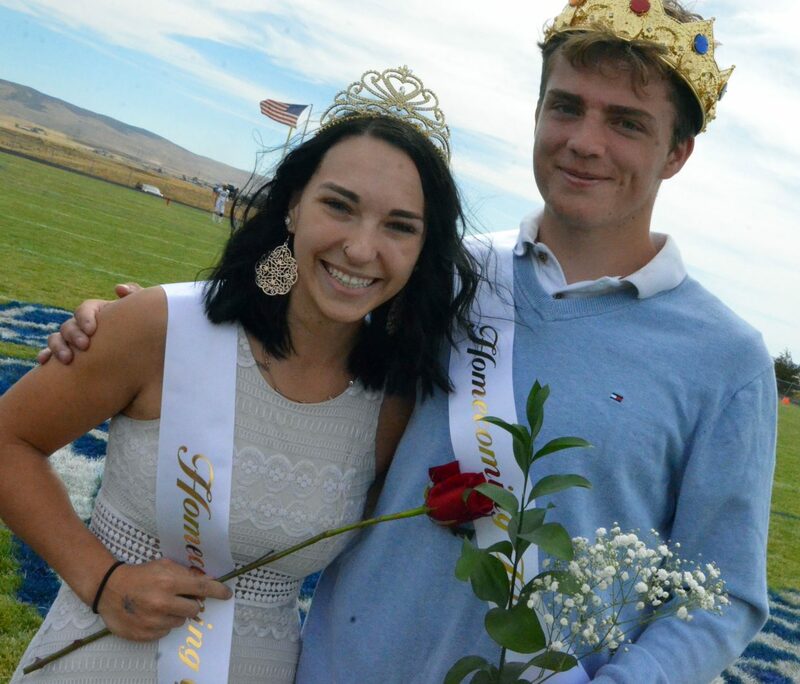 Moffat County High School's Quinn Pinnt and Jared Atkin accept queen and king honors at halftime during Saturday's Homecoming game with Basalt. Moffat County High School football players come off the field at halftime full of confidence during Saturday's Homecoming game with Basalt. 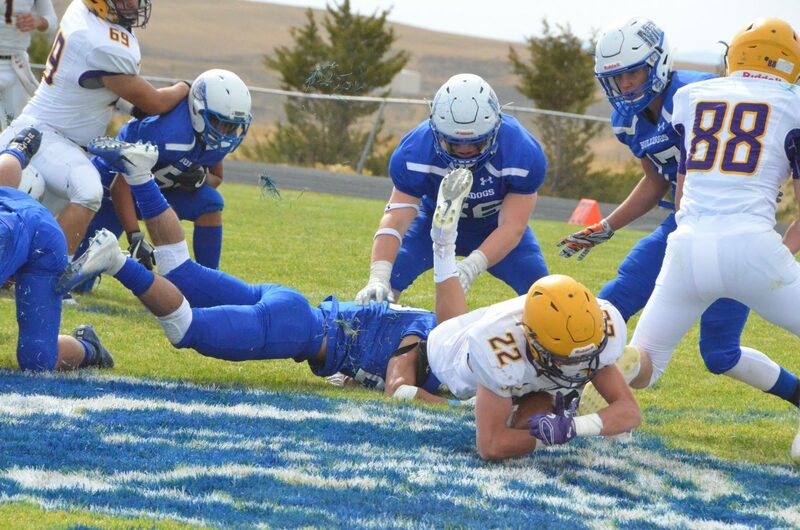 Moffat County High School and Basalt players pile up on a fumble during Saturday's Homecoming game. 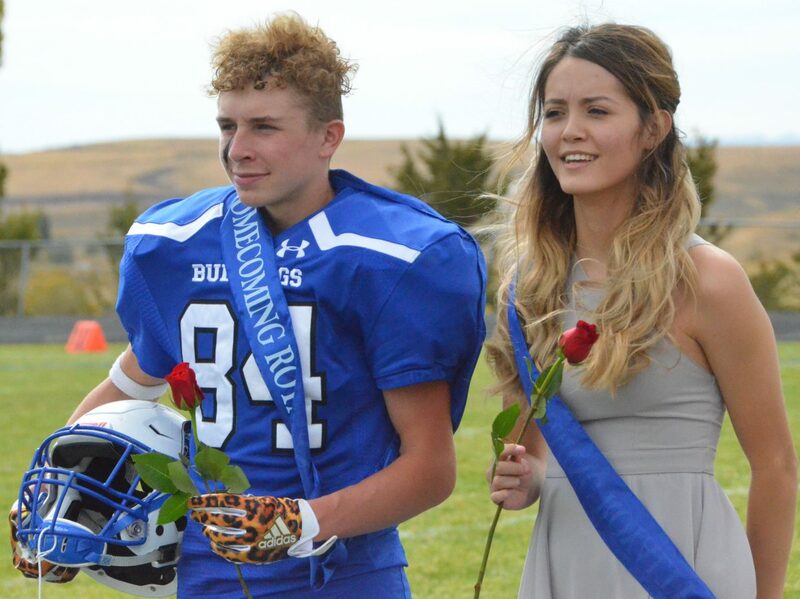 Moffat County High School's Dagan White and Marlyn Arellano accept junior attendant honors at halftime during Saturday's Homecoming game with Basalt. 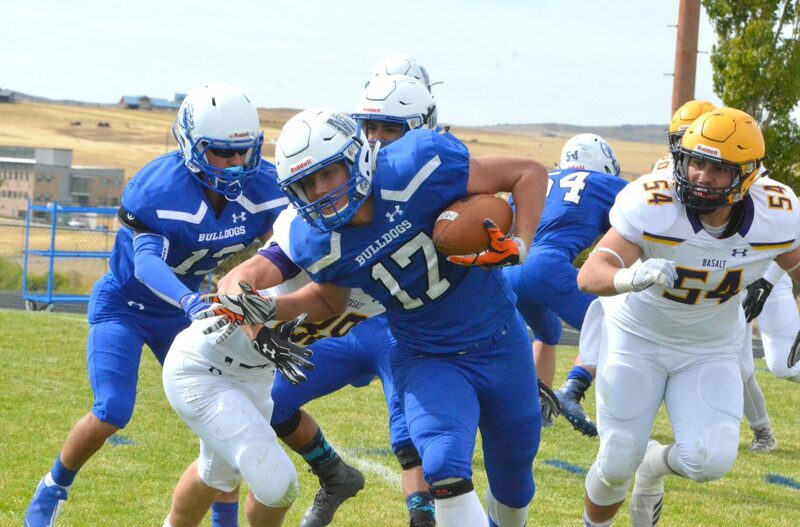 Moffat County High School's Ethan Hafey bears down on Basalt's Jake Reardon during the Bulldogs' Saturday Homecoming game. 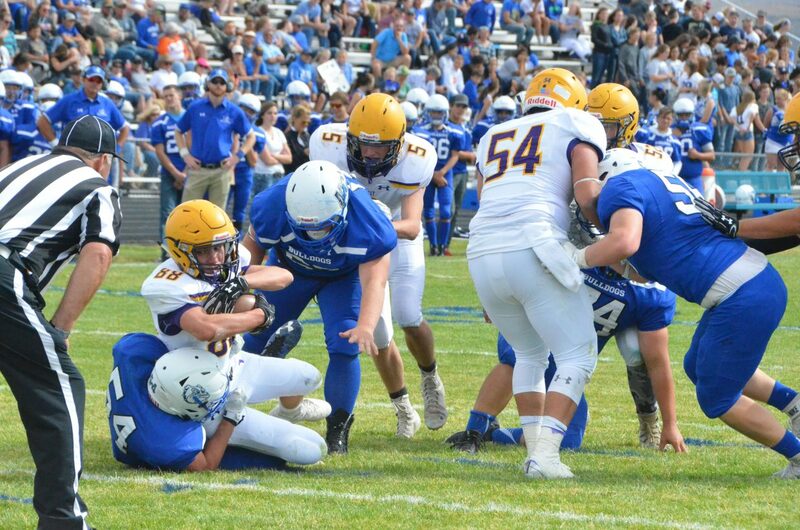 Moffat County High School's Jared Baker and Cale Scranton and Basalt opponents take a knee as an injury is tended to during Saturday's Homecoming game with Basalt. 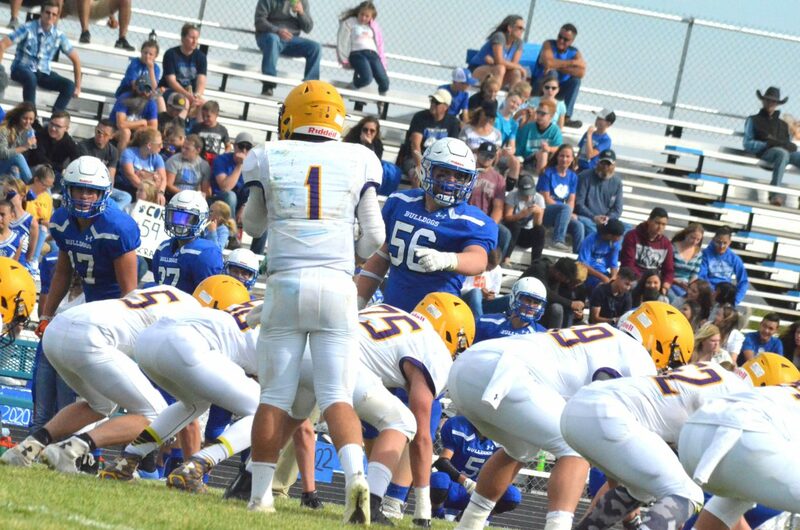 Moffat County High School's Dagan White and Josh Teeter are both in for the stop against Jake Reardon during Saturday's Homecoming game with Basalt. 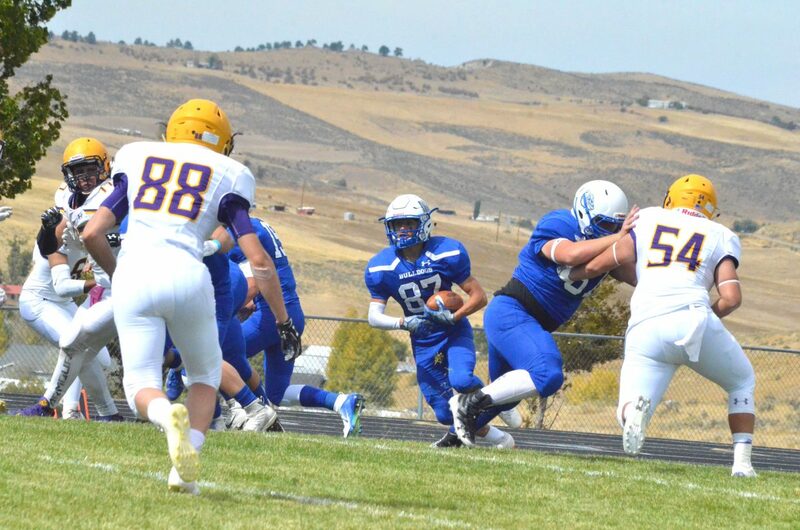 Moffat County High School's Cale Scranton turns the corner to get some extra yardage against Basalt during Bulldog varsity football's Saturday game with the Longhorns. 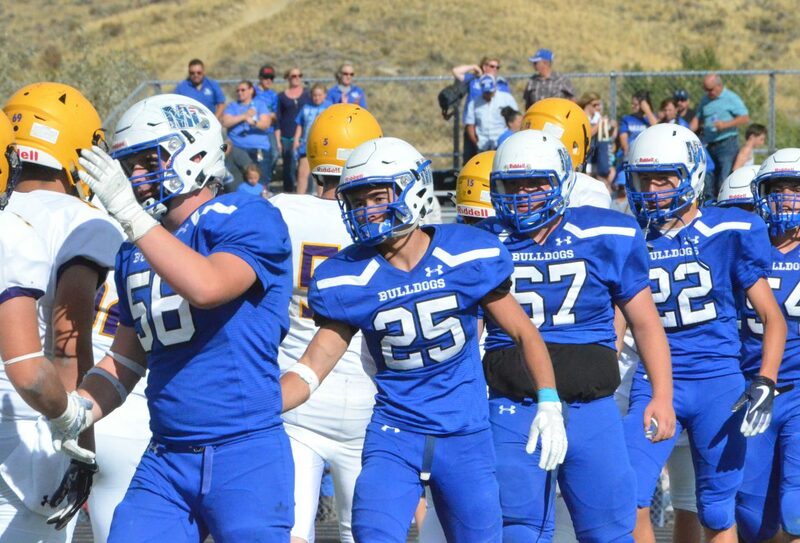 It may not have been an entry in the win column for Moffat County High School football, but when faced with the top-ranked team of the 2A Western Slope League, Bulldogs took a bite out of their opponents to show it’s anyone’s game in the conference slate. 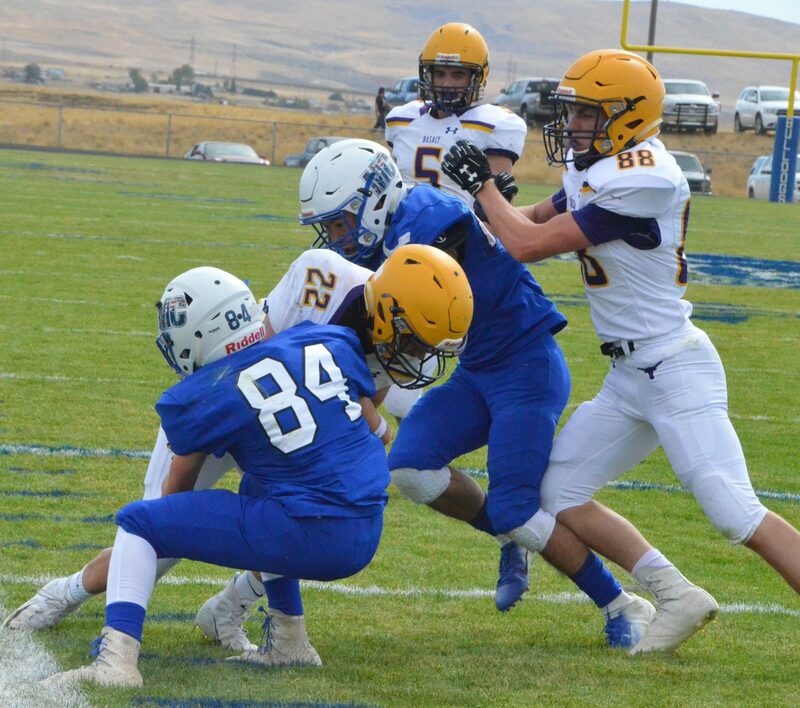 MCHS’s Saturday afternoon Homecoming match-up with Basalt ended with a 33-13 loss to the Longhorns, a result that was a mix of good and bad for the Bulldogs. 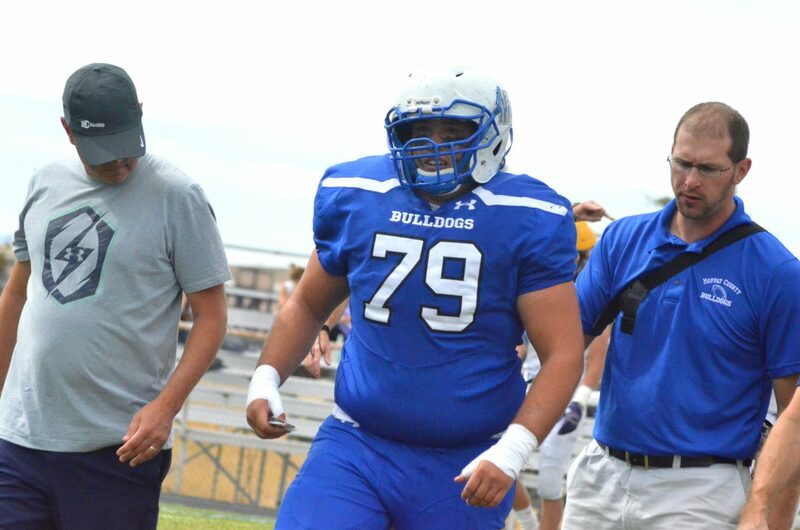 The MoCo Hoco energy provided an immediate boost for the Dogs, who kicked off to start and other than a 30-yard reception by Longhorn Dawson Hodgson, Bulldog defense stopped the opening drive cold. 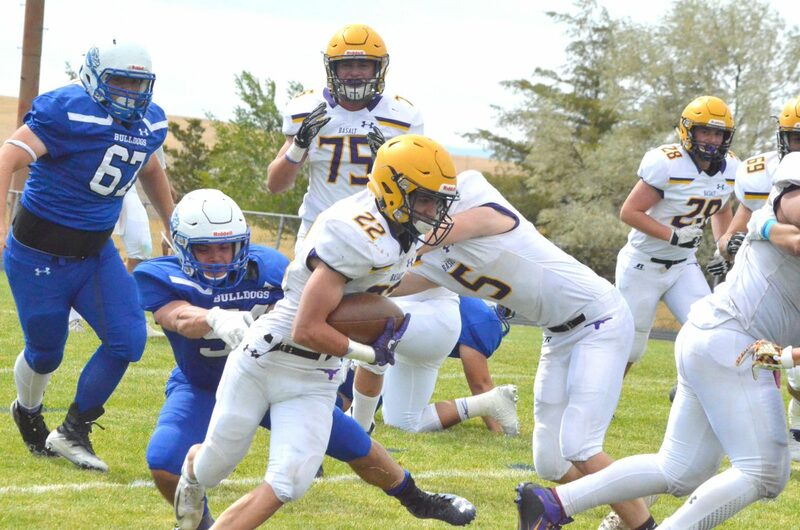 With an undefeated record this season combined with a defense that had only allowed six points, Basalt’s reputation was on Moffat minds but not enough to intimidate them as they took over. A little bit of luck and a Longhorn offsides call on fourth down got the Dogs into enemy territory, and no sooner were they in the red zone when Colby Beaver found Cale Scranton from 18 yards out to gain the first score. MCHS was soon down a man when lineman Bryson Davis limped off the field with a knee injury, while the Longhorns gained enough small gains to stay ahead of the chains, ultimately finishing with a counter play by Jake Reardon with seven yards straight to the goal line, adding a PAT to boot to make it 7-6. 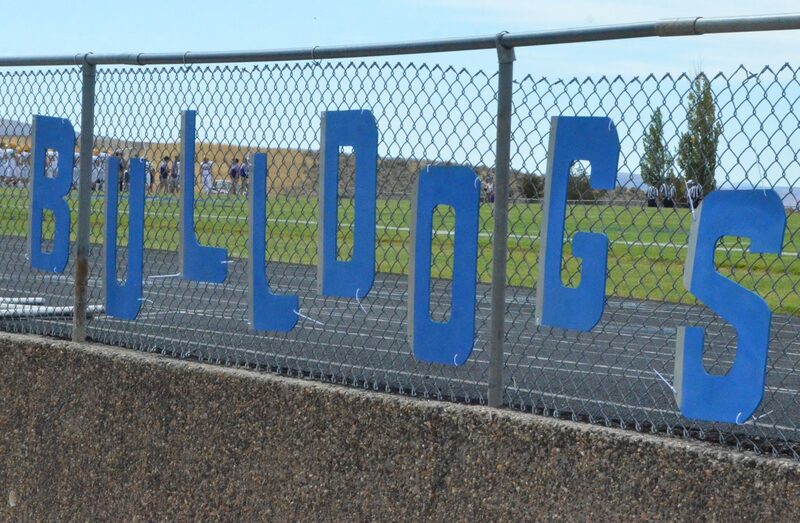 A Bulldog push to retaliate didn’t go anywhere, but the blue boys locked down Basalt at midfield with batted-down passes and more, including a sack of quarterback Trevor Reuss by Scranton to end the first period, and the Longhorns’ fake punt attempt didn’t materialize. Neither side scored in the second period, but it was far from dull with plenty of turnovers, starting with Scranton stripping the ball from Reardon as Kevin Hernandez recovered the fumble. 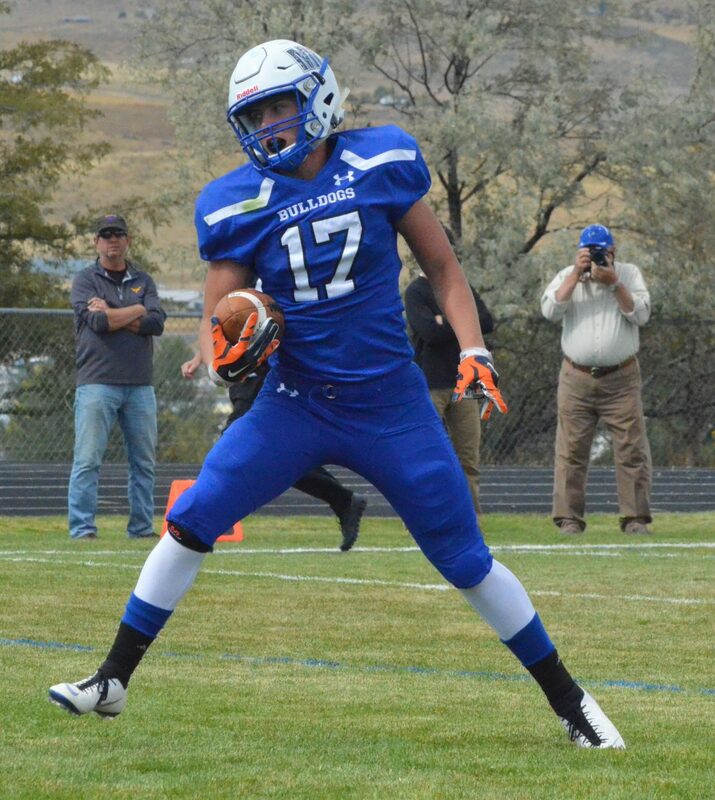 With Longhorns primed to score again, Tyler Fortune returned the favor with a grab that turned the action around as he got 16 yards for Moffat County on the return. 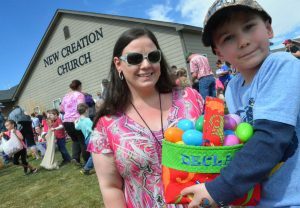 “I really wanted to get a win for the seniors, help them go out with a bang,” said the MCHS junior. 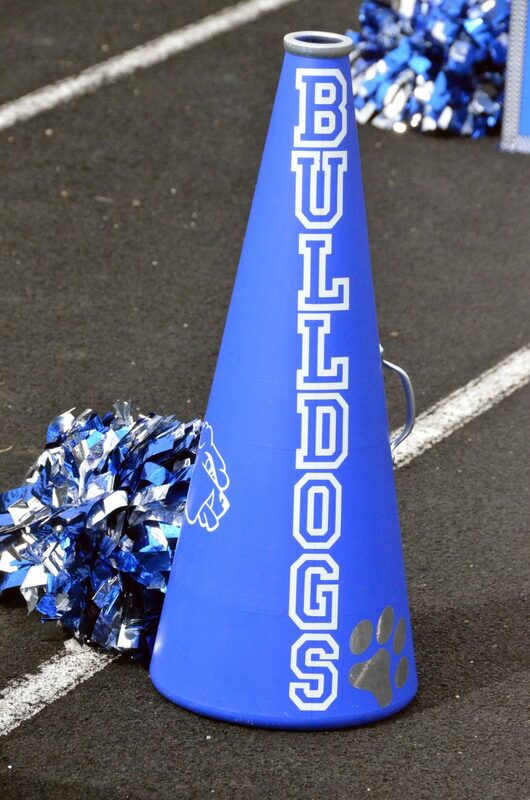 Though Bulldogs couldn’t get any more points on the board before the horn, spirits were high and only got higher with performances by the cheer team and band, followed by the Homecoming coronation. MCHS Student Council selected the school’s custodial staff as honored faculty. 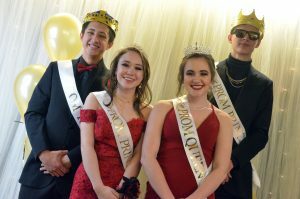 Attendants for the freshman class were Logan Hafey and Emma Jones; Blake Juergens and Emaleigh Papierski for the sophomores; while White hustled back to the field to join Marlyn Arellano to represent the juniors. Homecoming king and queen went to seniors Jared Atkin and Quinn Pinnt. 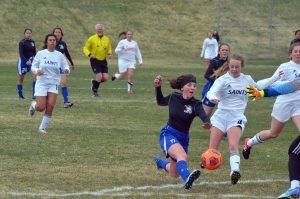 The invigorated home team returned the second-half kickoff and stayed stuck at the 45 from there, with a punt into the wind giving Basalt extra yardage, swiftly getting the ball rolling as Reardon scored again from five yards. 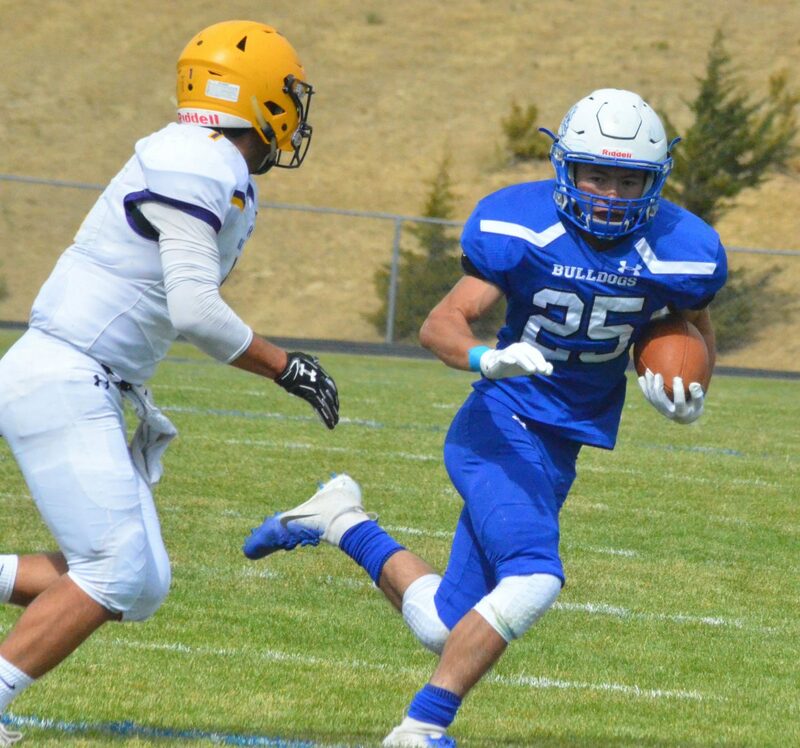 He added another TD from 17 late in the third quarter, while the Moffat County offense started to implode with a disastrous drive that saw Beaver sacked twice in a row as the Bulldogs went backward and Hernandez barely got off the punt from within his own end zone. The Longhorn lead kept growing as Reardon scored all five of the team’s touchdowns with 227 total rushing yards, but Moffat County defense started clicking again as Victor Silva snatched a midfield pass from Reuss for the interception and Beaver whipped it to Scranton and Josh Teeter for quick gains, with Scranton scoring again to get the team into double digits. 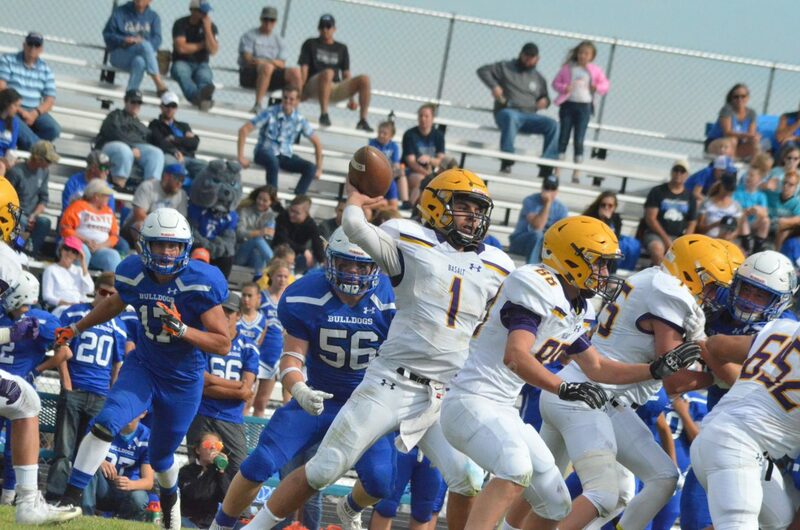 Beaver threw for 110 yards with 10 of 22 passes finding their mark, as well as a personal best in rushing for the Bulldog QB with 42 yards, part of 109 the team had on the turf, with Hernandez adding 25 and Dario Alexander 15. Scranton ran for 14 yards while he was under center, as well as catching for 87. On the other side of the ball, Scranton’s return to defense amounted to 16 total tackles to lead the day, with Teeter and Angel Rodriguez tying for 13 and 10 for Hernandez. Altogether, the Dogs amassed 100 tackles to exemplify a game where giving up was never an option. In RPI rankings, Basalt was third in 2A going into the day, the highest placement for the conference, a status that didn’t escape Bulldog coaches. 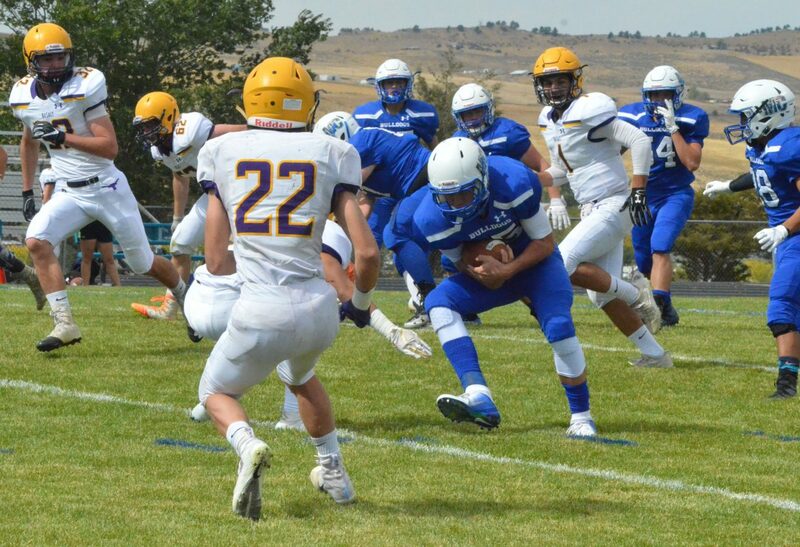 Though Nelson was stung by the loss for the 2A WSL debut, the highlights of the day were that, despite Basalt’s pristine tally — now 5-0 — the Dogs are the first team this season to score more than one TD against the Longhorns, proving a legitimate threat to the defending conference champs. 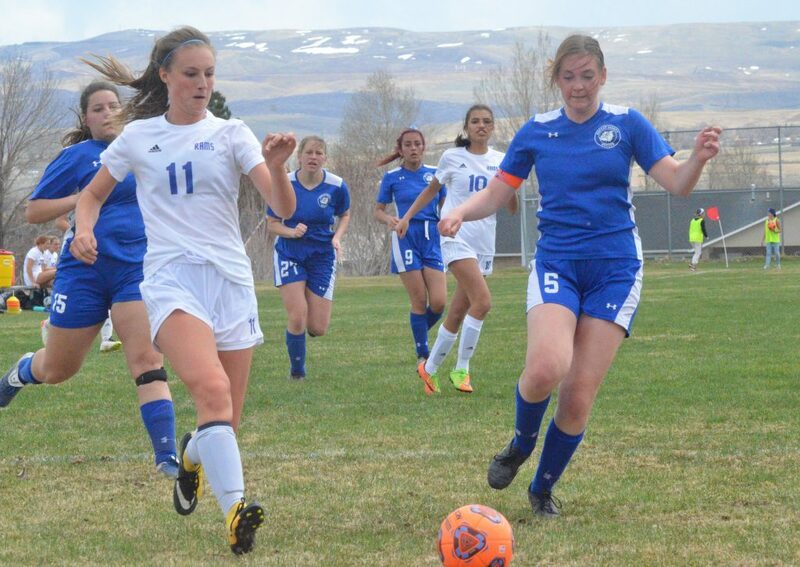 “We were really on our heels in the first half then really came out and played well in the second. 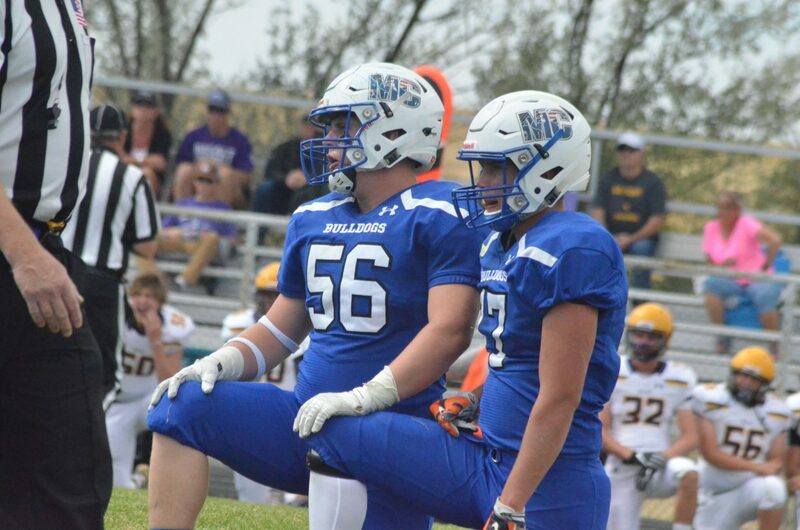 Coach Nelson did a great job — they were prepared and had a good little defensive scheme,” Frerichs said. 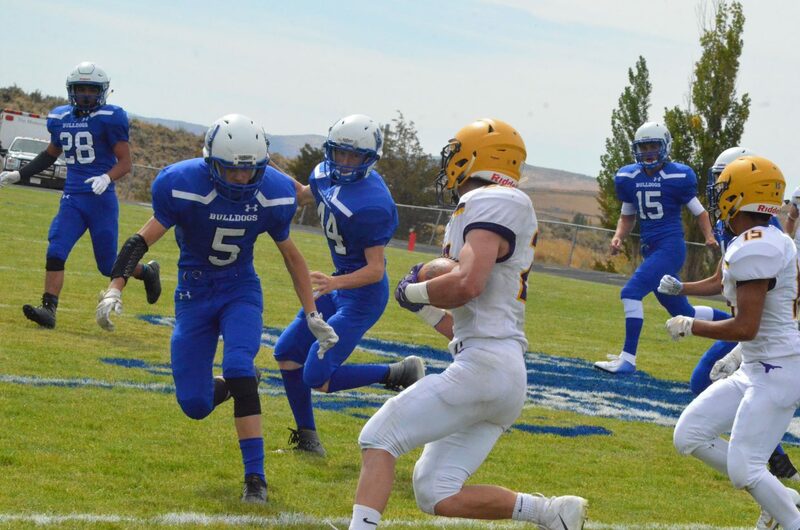 While Basalt has spoiled two consecutive Homecoming games — shutting out Paonia 16-0 the week before — the Longhorns will return to their own school pride game, hosting Coal Ridge Oct. 5, the Titans looking to recover from a 36-8 loss to Rifle. 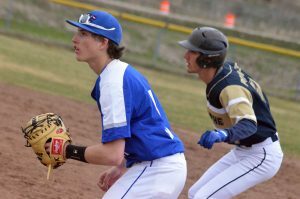 MCHS is 2-3 as they look toward their next league foe, traveling to Aspen. The Skiers were in Delta Friday and fell 49-40 to the Panthers. 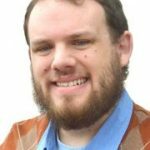 The schematic will be wholly different for the new week against a pass-heavy team like Aspen compared to Basalt’s commitment to the ground game, Nelson said, but he has faith that defense will be able to adapt. “Proud of our players; we’re learning and growing,” he said.